A shortened version of this post was adapted for Symposium Magazine‘s article Understanding the Irrational Commuter, which appeared in the September 2013 issue. One of the hypotheses which might explain why people don’t choose the shortest travel time path is that not all travel time is created equal. We’ve done a series of experiments looking at how people perceive and value travel time under various conditions. There are two basic ways to ascertain valuations in travel behavior research, one is called revealed preference which examines the decisions people actually make and infers the causes using statistical tests. The second is called stated preference, where people are presented a set of hypothetical scenarios, and asked to choose between them. The advantage of revealed preference is that it is based on real decisions. Unfortunately, it is unable to provide insight to alternatives that don’t exist yet (differences of kind rather than quantity, or that are beyond the ranges currently observed), or that travelers have not themselves experienced. For an extreme example, suppose you wanted to predict ridership on the Hyperloop. While we have data on people’s willingness to drive or take airplanes (or intercity buses) we don’t really have information about the willingness to tolerate particular specification of Hyperloop, responses to the comfort/discomfort in conditions of rapid acceleration and deceleration. So instead of relying on observed behavior alone, we would try to get estimates using other kinds of experiments. The simplest would try to describe the alternatives in words (either orally or printed) and ask people which they would choose (e.g. 30 minutes, high deceleration, $100 vs. 1 hour, airplane ride, $50). But as you might imagine, people might answer these questions differently in a survey than they would if they were faced with the real choice. The experiments described below use hybrids between stated and revealed preference, where the subjects gained some experience with alternatives beyond a simple word-based description. Bicycling has seen a resurgence in many parts of the United States, from a being a fringe mode to gaining a significant number of users. In the City of Minneapolis, which is perhaps surprisingly at the forefront of this trend, bicycle mode shares to work are on the order of 4% (compared to about 0.5% nationally), and much higher in some areas (Downtown and near the University of Minnesota) and lower in others. Some studies have put the number as high as 11% of all trips. Some of this increase is due to greater investments in bicycling infrastructure. (And of course, this investment in bicycle infrastructure is due in part to increasing numbers of bicyclists lobbying for it). As part of his Master’s Thesis, Nebiyou Tilahun, now an Assistant Professor at the University of Illinois at Chicago, Prof. Kevin Krizek (now at the University of Colorado) and I examined the weights people assign to factors when choosing bicycle routes1. While we couldn’t use a full-fledged driving simulator for this experiment (such devices are not cheap), we did the next best thing, we used a computer-based study with conditions shown as first person videos of riding a bicycle in different conditions. This presentation of alternatives is based on Kevin Krizek riding a bicycle, hands-off, taking a video camera and videotaping each condition. He’s an avid bicyclist and for people who don’t know him, his bicycles are probably worth more than my car. So the question is essentially: Imagine you are commuting by bicycle and Routes 1 and 2 are the available choices. Route 1 is a nicer, off-road facility, but takes 40 minutes, while Route 2 is adjacent to traffic, and takes 20 minutes. Which do you prefer? Then based on your choice you’d get another presentation where the travel times would change. One travel time would become higher or lower depending on what you answered. This allowed us to determine an indifference point, where you were indifferent to Route 1 or Route 2. While everyone prefers the high quality route, all else equal, the indifference point varies by person. It systematically differs by gender. Women report they are willing to pay (in travel time) more for a higher quality off-road route than males are, though the general patterns are the same. It also varies by season: in the (cold, Minnesota) winter travelers are not willing to pay as much time to get a better quality route than in the summer. Ramp Meters (sometimes called merge lights or flow signals) are traffic lights at freeway entrance ramps that ration the number of cars entering onto the freeways in order to smooth out traffic. This ensures that “platoons” of cars, a series of cars all following a leader (many early traffic engineers had a military background) are not all entering at once. Meters have also been used to ensure that the total number of cars on the freeway is below the capacity of downstream bottlenecks. Now common in many cities, they were first deployed in 1963 in Chicago and then Saint Paul starting in 1969. In the year 2000, controversy arose about the effectiveness of the ramp metering system in the Minneapolis-Saint Paul region. In particular, some people were highly concerned about long waits at metered entrance ramps, which anecdotally people reported to be as high as 20 minutes. Unfortunately, at the time, there wasn’t any way to systematically determine the actual duration of waits. The Minnesota Department of Transportation (MnDOT) was instructed by the state legislature to turn the ramp meters off for at least four weeks as an experiment. 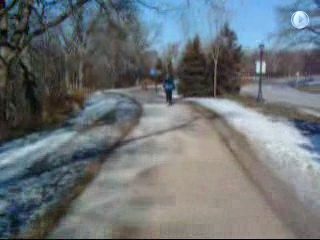 In fact, MnDOT continued the experiment for over 8 weeks. MnDOT ultimately concluded that ramp meters were valuable, but changed the metering strategy to reduce maximum queues at the ramps to no more than 4 minutes. In light of this ramp metering shutdown, Kathleen Harder, John Bloomfield, Kasia Winiarczyk, and I conducted two experiments with the same framework where the essential difference was in how we asked the question2. The first is a classical Stated Preference experiment, administered on a computer, which to distinguish we called Computer Administered Stated Preference (CASP). Noting the weakness of stated preference is that people may respond differently to hypothetical situations, especially scenarios they have never experienced, we developed a second experimental method that we labeled a Virtual Experience Stated Preference (VESP). In the Virtual Experience Stated Preference we put subjects in a driving simulator. This car, a 2002 Saturn Coupe, is on the third floor of the HumanFIRST Laboratory at the University of Minnesota’s Mechanical Engineering building. It is enveloped in a set of screens, and the driver is surrounded by animations which make it feel like driving. The simulator has speakers, and it vibrates, to add to the verisimilitude. When the driver turns the car, then the point of view changes. It’s a very sophisticated set up. (However, the 10 percent of the population sensitive to motion sickness are advised not to use driving simulators, and were excluded from the study. Subjects who completed the VESP said they reported no discomfort). There were many different conditions that were tested. In one set of conditions, subjects had to rank four alternatives, which were exactly the same for the virtual and computer experiences. In the CASP, this was presented in a bar graph showing total travel time and the travel time of each component, with clear text labels. If you were strictly rational and cared only about minimizing total travel time you would prefer 10 miles in 16 minutes. But travelers had a mental model of what waiting at a ramp was like and a mental model of what driving in traffic was like, and only 1 of 44 subjects preferred to minimize total travel time in this CASP presentation. In the VESP people nominally experienced the same conditions. However 15 of 17 subjects preferred the total travel time minimizing condition. Simultaneity vs. Sequencing. In the CASP they were looking at all the four options simultaneously and they’re doing this in about 15 minutes, however long it takes them to read the screen for multiple presentations of similar questions. They’re evoking from their memory previous experiences about what travel conditions are like. In the VESP it is a longer time, the whole experience takes 90 minutes because we gave them those four presentations in sequence. They were sitting at the ramp meter and then driving through congested traffic, and we asked them questions at the end. Recency. In the VESP there is a recency effect. The thing that you remember the most at the end of the trip is that you have just been through stop-and-go traffic. And you think to yourself, ‘I don’t like stop and go traffic’; whereas the ramp meter was a long time ago. Simulator Realism. The stop-and-go traffic in the simulator may be more (or less) intense than how any particular traveler experiences traffic. In the CASP they’re remembering their actual work trips while. Goal-directedness. In VESP travelers are in a driving simulator because the researcher tells them to be and not because they have any real goal at the end of it, except collecting the $25 for participating in this study. In the CASP, subjects may be recalling the goal of their own work trip. In theory, nothing beats the real world, so what could better simulate different road conditions but driving in actual traffic? Kathleen Harder and I conducted a study to try and ascertain certain value of information and route choice. We asked people, to drive from McNamara Alumni Center on the University of Minnesota Minneapolis campus to the Cathedral in St. Paul by different routes. Each person was asked to go down one route and come back on another route and go down on a third route and back on a forth route, and after each of these rate those routes. The routes in the study were I-94, a depressed (and perhaps depressing) freeway connecting Minneapolis and St. Paul, University Avenue – an auto-oriented commercial, industrial, and retail street that had seen better days (this took place before recent construction to install a LRT along the corridor), Grand Avenue (a pedestrian oriented retail street), Summit Avenue (a beautiful boulevard lined with nice homes and mansions), and Marshall and Selby Avenues (a mix of residential and industrial uses). We had students collecting data and giving instructions at each end of the experiment. We provided some drivers the “expected” travel time of the route. The data collection was led by Brendan Nee (now a principal at BlinkTag and designer of a number of traveler information tools). We had a GPS unit in the car so we knew exactly how long it took them. We randomized who took which route in which sequence. We estimated models that would predict which route people would prefer; we asked what route would you prefer for commuting, which route would you prefer for shopping trips or going to entertainment, and so on, with the idea that commuting trips would present a different set of preferences than for discretionary trips without the rigorous time constraints. Part of Lei Zhang’s dissertation work estimated this model and used a machine learning algorithm to identify the explanatory factors3. His dissertation goes on to develop a Behavior User Equilibrium, in contrast to the Wardropian User Equilibrium discussed in the previous post. 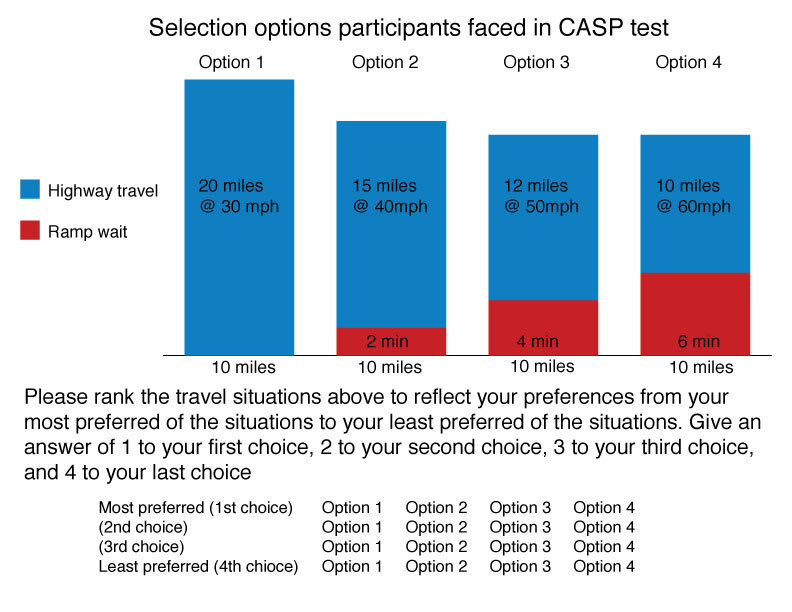 The idea is that users are not minimizing travel time, but instead making choices that satisfy a set of heuristic rules which embed preferences for a larger set of factors, and that these behavioral factors need to be discovered empirically, through Search, Information, Learning, and Knowledge acquisition. This SILK Theory presents a very different paradigm for modeling route choices than traditional User Equilibrium, since it is a positive, empirical approach which describes what people actually do instead of a normative approach which ascribes to people what we believe they should do (in their own interest). As part of this research, we discovered a set of decision rules that explain driver preferences. Drivers will switch to a new route if the difference in time is great, or if the difference in time isn’t so great but the pleasure obtained from the route is higher. Drivers prefer familiar routes. They consider aesthetics, e.g. 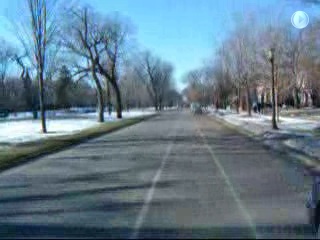 Summit Avenue is a nicer road than University or Marshall Avenues to drive down. People don’t like stopping at stop signs, people like driving on routes that they’re familiar with, and of course people like to have information about how long it’s going to take (even if the information has only a passing resemblance to reality). Running due west from Minneapolis, I-394 was the last Interstate Highway opened in the Minneapolis-Saint Paul region. As one of the last highways, it face controversies in development, which resulted in some innovations once built. One of those was the use of a reversible High Occupancy Vehicle (HOV) lanes on the eastern part of the route and regular (peak period, non-reversible) HOV lanes on the western part of the route. As with HOV lanes in many cities, they are designed to provide a travel time advantage to vehicles that carry more than one passenger, and of course to buses. However, it turns out that there is insufficient demand from HOVs in this corridor to fully utilize the capacity available in the HOV lanes, while the parallel (General Purpose) lanes remain congested during the peak periods. This is inefficient. One solution would have been to open up the lanes to all vehicles, but this would remove any time savings for HOV vehicles and bus passengers. It would also make it difficult to restore HOV status to the lanes in the future, as that would be perceived as a taking-away capacity, and as Kahneman and Tversky point out in their work on prospect theory (corroborating experience in the transportation field from previous unsuccessful attempts to take-away general purpose capacity for HOV lanes), people are very loss-averse, more than gain-seeking. The implemented solution transformed the HOV lanes to High Occupancy/Toll (HOT) lanes. HOT lanes allow vehicles equipped with transponders to use what were the HOV lanes for a price. This toll varies with traffic conditions, but aims to ensure that the HOT lanes maintain lower travel times than the general purpose lanes. Travelers in a hurry might be willing to pay a premium to guarantee they can avoid congestion. Other travelers won’t. Kathleen Harder and I conducted a study on the I-394 corridor, with graduate students Shanjiang Zhu and Carlos Carrion (now a post-doc at SMART: Singapore MIT Alliance for Research and Technology), using a methodology we call Actual Commute Experience Revealed Preference. The aim was to combine the best of these studies, use each commuter’s actual origin and destination, but make sure they experience alternative routes and that they’re not just bound to the route that they normally travel on 4. We recruited subjects who live along the I-394 corridor, people who lived out in Plymouth and Minnetonka and other western suburbs. They were required to have a daily route of at least 20 minutes so that the alternative commutes would make sense, that I-394 had to be a plausible alternative for them, they commuted on a regular basis, they worked near downtown Minneapolis, and that they drove a car alone. We obtained permission to install a GPS unit in their vehicle, and they had to follow our instructions about which route to take which weeks. In the end, we discarded the results from a number of subjects because they didn’t follow instructions. We gave them three sets of alternative routes: one was the HOT Lane on 394; one would be the general purpose (un-tolled) lanes; and one would be a parallel arterial, which depended on where they lived, and which would be most feasible. We asked them questions every week about what they were doing, we installed a GPS unit in their vehicle, gave them two weeks of free choice in the beginning (to establish their baseline preference), for the middle six weeks we told them for each two week period please drive on a particular route. For the final two weeks, travelers were again free to pick a route, which allowed us to see if their behavior changed after the experience. The official aim of this study was to ascertain the Value of Travel Time Reliability. This is, how much of a premium are drivers willing to pay to have a low variation in their travel time. The HOT Lanes offer a lower travel time, but more importantly, they offer a much more reliable or predictable travel time, it is much less likely to vary than the congested general purpose lanes, which might have an average delay of 2 minutes, but some days might be much much higher. Depending on how we measure variability we get estimates of value of time ranging from $9 to $20 an hour. We also get a value of reliability ranging from $3.80 to $18.23 an hour. Other people have tried to estimate a reliability ratio in the literature, using a variety of methods, and the numbers vary widely, typically however they are on the order of 1.0, indicating that avoiding a minute of standard deviation is as valuable as avoiding a minute of expected travel time. So people are choosing routes not just based on travel times, not just based on ramp time being different than freeway time, not just based on aesthetics and familiarity of routes, but also considering the travel time reliability – how predictable is the time and they might choose one route not because it’s the shortest time on average but because they have a high probability of not being late more than, say 5 percent of the time. One of the things you learn when doing travel behavior experiments is that people don’t always respond the way you think they will. Travelers may not follow instructions on their daily commute, even though they agreed to. As the experiments with the driving simulator show, the methodology can greatly shape, and even reverse the result. So all experiments provide information, but none can be definitive. As Carl Sagan put it “Extraordinary claims require extraordinary evidence”. Tilahun, Nebiyou Yonas, David M. Levinson, and Kevin J. Krizek (2007) Trails, Lanes, or Traffic: Value of Different Bicycle Facilities Using Adaptive Stated-Preference Survey. Transportation Research: A Policy and Practice 41 (4) 287-301. Levinson, David, Kathleen Harder, John Bloomfield, Kathy Carlson (2006) Waiting Tolerance: Ramp Delay vs. Freeway Congestion. Transportation Research part F: Traffic Psychology and Behaviour Volume 9, Issue 1 , January 2006, Pages 1-13. Levinson, David, Kathleen Harder, John Bloomfield, and Kasia Winiarczyk. (2004) Weighting Waiting: Evaluating the Perception of In-Vehicle Travel Time Under Moving and Stopped Conditions. Transportation Research Record: Journal of the Transportation Research Board 1898:61-68. Zhang, Lei (2007) Developing a Positive Approach to Travel Demand Analysis: SILK Theory and Behavioral User Equilibrium. Transportation and Traffic Theory – 2007. Proceedings of the ISTTT Elsevier. Zhang, Lei and David Levinson (2008) Determinants of Route Choice and the Value of Traveler Information: A Field Experiment. Transportation Research Record: Journal of the Transportation Research Board 2086:81-92. Zhang, Lei (2006) Search, Information, Learning, and Knowledge in Travel Decision-Making: A Positive Approach for Travel Behavior and Demand Analysis. Dissertation University of Minnesota. Carrion, Carlos and Levinson, D. (2013), Valuation of travel time reliability from a GPS-based experimental design Transportation Research part C Volume 35, October 2013, Pages 305–323. Carrion, Carlos and David Levinson (2012) Value of Travel Time Reliability: A review of current evidence. Transportation Research part A 46(4) 720–741.